:Our matching folio features hits from Passion, Tim Hughes, Sonicflood, Matt Redman and many others. Songs include: Breathe * Forever * Give Us Clean Hands * I Could Sing of Your Love Forever * Let My Words Be Few * Open the Eyes of My Heart * Salvation * You Are My King (Amazing Love) * more. 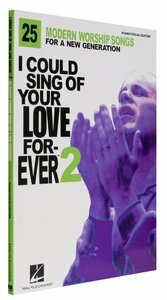 About "I Could Sing of Your Love Forever 2 Music Book"